Barefoot Resveratrol Anti-Aging Tonic: Resveratrol Anti-Aging Tonic the Natural Viagra? Resveratrol Anti-Aging Tonic the Natural Viagra? As a long time blogger and researcher of benefits of the product we market I ran across some suprising information. You must remember this is just my personal findings from the research I done. It has long been somewhat of a mystery as to why the French could eat a high fat, high calorie diet and have a lower incidence of heart disease and live long healthy lives. It was known that wine had something to do with it but over the last couple of years, compliments of Dr Sinclair of the Harvard Medical Center and Rafael De Cabo Phd., they may have isolated the properties that answer the mystery. The key is resveratrol in the fermented skins of the red wine grape. There have been published papers on the fact that people (or animals for that matter) who have calorie restricted diets live longer. Resveratrol does many things for the body including fooling the body into thinking it is calorie restricted. Hence, the French eating high calorie, high fat diets (with wine) may live longer with less incidence of heart disease. Here is some interesting information on various studies on resveratrol and the promising results. - According to a study done by the Dept. of Science and Technology at the Ohio State University in 1997, resveratrol was able at a cellular level to inhibit cancer cells from dividing. It also demonstrated that the estrogenic activity was able to prevent post-menopausal bone loss. - The Dept of Microbiology-Immunology NE Ohio University, College of Medicine, successfully treated hairless mice that had herpes lesions. Repeated tests with topical resveratrol had the same results. In the same year it was also discovered that topical reseveratrol reduced skin cancer by as much as 98%. - In another study in April of 2008, patients who were treated with resveratrol before receiving radiation treatments, found that pancreatic cancer cells would die off during radiation sessions. This is very encouraging because pancreatic cancer can be very difficult to treat. - Now, very interesting, what does resveratrol have in common with Viagra? They both open restricted blood flow. Viagra is limited to small blood vessels but reseveratrol opens both small blood vessels and main arteries. The circulation benefits of resveratrol may outperform Viagra. - The reasoning behind resevratrol being hailed as the potential fountain of youth is because taking resveratrol regularly has been demonstrated to protect and or reverse DNA damage. Aging comes about when cells can no longer replicate cell DNA and thus begins the gradual decline of the body. Resveratrol stimulates what is called the longevity gene (caloric restricted diets) and it has been demonstrated that resveratrol protects and repairs DNA. There is still much studying to be done on resveratrol, especially on humans but the research so far has been more than promising. 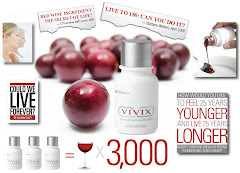 A glass of wine a day can be beneficial but good quality, pure resveratrol anti aging tonic such as Shaklee's new product called "Vivix" has the potential for great health benefits!